Butterfly decorations, our exclusive 'triple layered' style butterflies have wings with three layers of unique color. The wings are embellished with pretty sequins & glitter to add extra pop and are typically hung from walls or the ceiling using a thin clear line. Curtain tie backs are also available allowing you to mix & match with other styles. While these butterflies are very popular for girl's rooms they are great for many other decorative designs for home decor, weddings, baby showers, or birthday party. Ideal for baby nursery, kids bedroom, girls room & home decor. Nylon hanging butterfly has a three (3) layered wing design accented with color matched sequins, glitter and has a fabric body. This pretty organza butterfly decoration is made with a soft bendable wire frame. Hang this beautiful butterfly from the ceiling or attach to the walls (hardware not included). Butterfly comes prestrung with a piece of clear fishing line and round plastic hoop for easy hanging, which is perfect to hang butterflies from the ceiling or it can be removed if attaching to the walls. Width measurement is complete wingspan. This hanging mesh nylon butterfly decoration comes in a variety of colors & sizes as well as curtain tie backs (sold separately). 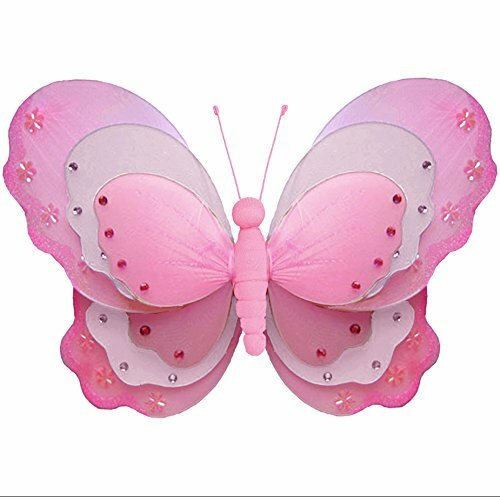 This colorful butterfly is also a perfect decorations for girls birthday party, baby shower or wedding decor. Please note: sizes are approximate, handmade & variances may occur. Sold individually; mix-and-match styles, sizes & colors as they are designed to coordinate together.